Last month we finished our prototype 1 build. In Update #47, Josh outlined our goals for the first prototype, which focused on establishing "that IE feel". Not only did we hit that mark with the look of our characters and environments, but we also hit our target with movement, combat, and gameplay systems. Core basics that you all expect from Project Eternity such as party movement, melee and ranged combat attacks, containers (with loot! ), doors, using special class abilities and spell casting, area transitions, inventory and equipment are all in the game and functioning. We also established working character and environment pipelines - the art team is now able to create beautiful rendered areas, and we can model armor sets for all of our uniquely proportioned races. Additionally, we've established that we can efficiently concept, model and animate creatures for our soon to be growing bestiary. The creature we built for the first prototype is the Skuldr. Skuldr have poor vision, but they use a form of echolocation to perceive the spirit world. This allows them to “see” souls, making it difficult to use stealth to avoid them. After the prototype 1 audit meeting, Josh and I came up with a plan for what we would like to see the team tackle in prototype 2. Josh has previously mentioned a few of the goals for prototype 2 which include fog of war, character voice sets, crafting, stores, AI patrols, and the melee engagement system. Besides the expanded feature implementation, we are going to put our pipelines to the test on another set of new environments and creatures before moving into production. The plan for prototype 2 is to create a small village with a handful of buildings to enter, including a shop and inn. To the east of the village is a medium sized wilderness area with access to a small cave dungeon interior. The prototype also includes a large dungeon (I won't spoil the contents of the dungeon, because some of the ideas in the prototype will eventually make their way into the shipped game). All of these areas are connected by a complex multi-stage quest with several objectives (some optional) and with many different ways of completing it. The team has been working on a second prototype for the past two weeks now. Here's a sample on what each department has been working on. Dynamic Cloth - We are doing further research into character dynamism, and are creating capes for our characters to equip. Dungeon - Our goal for the dungeon is to make an interior area that lives up to the IE games. The dungeon has a variety of rooms that are unique and organic. 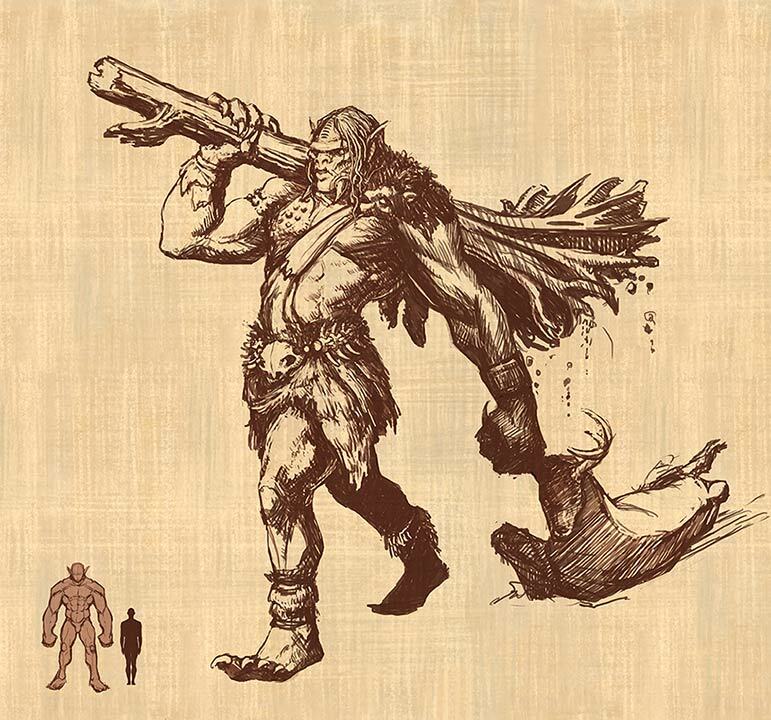 New Monster - One of the new monsters we are creating for prototype 2 is an Ogre. He has already gone through the concept and modeling stage and now is off to be animated. Complete Bestiary - The bestiary list has been worked over a few times by the area and narrative designers. We are now pretty close to having a complete creature list! Class Abilities for the Monk and Ranger - The Monk's "wounds" resource is in, and next up is the mechanics for the Ranger's animal companion. The class progression for the Monk and Ranger has been designed out to level 12. Town Guard A.I. - How do guards protect the village when you start casting fireballs in the town square? They beat you down... or at least try to. The guards will hook into the reputation and faction mechanics, which tells guards when they turn hostile towards the party. Fancy Material Shaders - We now have fancy materials for creating shiny armor and translucent ghost skin. Another set of shaders are "Tint maps" materials that enable the customization of skin and clothing colors just like in the IE games. In the future we will go into details into the design and implementation of the systems and features. Is there a particular feature that you would like to know more about? Tell us what you would like to see us talk about in future updates on our forums. We will be taking an update break next week so the team can focus on prototype 2 work. Thanks for reading and see you in two weeks! Thanks for the update. As for a feature id like to see a future update on it'd have to be more on the class progression spell/abilities/skills of the classes. Oh and feats too i believe you're calling them talents? I hope the Town Guard A.I. does not give us psychic guards that know we have done bad even if we killed the last known witness. Flowing cloaks sounds great, hope they do not clip though. Far too often sheathed weapons or quivers clip cloaks which is quite unsightly, I hope this kind of issue will be addressed. Though I can not think of a single game where this was done where clipping was not present to some degree. Also will we have wind and rain? If so will the cloak have more weight and hang when wet and flutter more when dry and windy? You are clearly shirking, the lot of you! Crack the whip, Monahan, 'tis sadly essential. Any chance of us seeing a video of prototype 1 in the next update? Skuldr's description is intresting and I like it very much, but model is maybe too pink . I like aesthetics of map and market town center style building layout. Dynamic cloths sound nice as in my opinion adventurer always wear long capes. Prototype 2 overall sound very nice. I wonder if we could see more details about class progression. yes, more info on classes...detailed info, with numbers and charts! no reason not to develop a proto build now rather than 2 years from now on release date. yes, I also second the motion of no psychic guards. Yep. I signed in just to weigh in on this. It also relates to the larger issues of faction and reputation, which apparently are important systems in P:E. Please make communication realism a priority for these systems. For every action that affects these systems, I want the game to ask itself, "HOW does word spread about this? Does it spread at all?" Also, just because one guard has heard of me, that doesn't mean that every single guard everywhere has heard of me. Let there be people who don't know my reputation, even if it isn't a secret. I am glad to hear about the goals and capability's of Armor in game. Can you please design the crafting system so that player crafted weapons and armor don't look like the same ones that we find in the world? I would like at the minimum to choose the dye color or possibly have the quality of resources I use to craft with show up in the final weapon. If I create a steel long sword, maybe its a little shinier than one dropped off a baddie. It would also be nice if a rusty long sword really was rusty. Also hopefully a +1 weapon isn't the same looking as a +2. Hooray for the bestiary. Here's my pet peeve with fighting in these types of games. There's not enough variety in encounters or types of enemy's. If you're going to have fewer types of baddies, please don't just change them from red to green and give them spears, work on making them intelligent encounters instead. Maybe its fewer tougher battles, but I like variety if I had my choice. Whatever ya can do to remove grinding across the board please do that. Although I still think it should be optional. As far as voice sets go, can ya guys try to create a few options for each type of class. I felt like in the old IE games there was like 1-3 good ones max and everyone sounded the same because I had to pick a voice. It would be superb if we had up to 4 battle cries per class character voice sets, because I think realistically after about the 50th time I hear the same battle cry I may really want to cry. 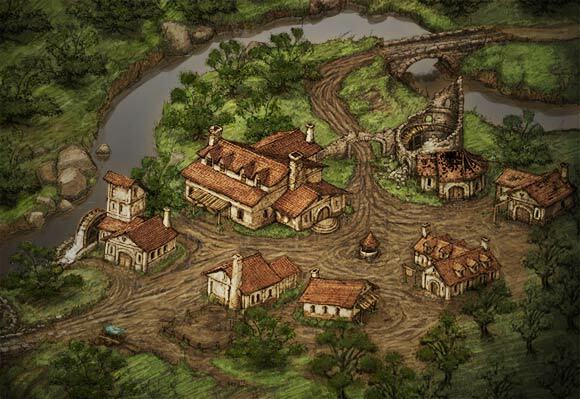 I'm totally feeling the concept art for the small village, it would be swell if you guys can create random puddles of water and mud to walk through in places like that. Especially if you guys do weather down the line. I'm really glad you have lots of ways to completing quests. I would like it if sometimes there are quests like scavenger hunts to maybe collect parts to build an epic weapon, or treasure maps that lead to booty hidden behind the right rock, etc. Finally, you mentioned making things organic. That's my hope as well. As much as I'd like things like duel wielding and choosing when to use left or right attacks to parry or block, I'd prefer things were organic more. By the way, here's a trick you can do in your artwork to give the impression of things moving. I feel like if you paint leaves like that for trees or on plants, it'll probably trick our eyes more than the previous attempt in the video we saw. Ogre walkin' like a boss (*chuckle*). Anyhoo, yet another awesome update! Would be interesting to hunt down this skuldr thingy for the peasants living in the mentioned village. It has a witchery/warhammery feel about it, makes me want to play this game really bad. I would like to know what non combat skills you have planned. Ah. That should sit well with some [forum] trolls. If I say the drawing of the town reminds me of Tristram, will I be pelted with tomatoes? I love the ogre drawing. The skuldr is cool too, although it's a bit more demon-y than I think I was expecting for the game, for some reason. That's not an objection, btw. would be interested in hearing more about mood and how you intend on developing tension in game. maybe some more music samples we can hear? a few thoughts. first, excellent job so far. things are seeming to come along nicely. keep up the good work. hopefully prototype 2 is as successful as 1. a few criticisms. bás dorcha (=lit. dark death). well then let's play off that. we can make a few names from sciathan leathair or bas dorcha or ialtag. or maybe the glanfath language has words for "dark death" or "leatherwing" or maybe "spiritmirror" (as it bounces/mirrors "sound" off spirits to find it. etc etc). anyway it's an idea. 2. any particular reason why a humanoid creature like the ogre has "tusks" coming out where jawbones might be? "coolness" factor aside, perhaps the tusks can be located somewhere less "cool" and more "useful?" An amalgamation of the elephant and the human would have tusks located inside the jaw as upper incisors (like they are in elephants). Yes, that makes them look like the typical ogres we've all seen, but that just makes more sense. Unless the jaw structure of the ogres in your game are different and they don't have a normal humanoid facial bone structure, i'd say it looks "weird." some people are particular about armor. i'm particular about my monsters "making sense." i thank you and skull-durrrrrrrrrrrrrrrrrrrrrrrrrr thanks you. skuldr doesn't fit the game. Biamhac did. Umm, I am pretty sure there are going to be names in multiple tongues in the game besides Glanfathan. I'm working on conlangs right now. Eld Aedyran is based on Old English and Icelandic with some other North Germanic bits thrown in. Is it me, or does that town have a massive Hommlet vibe to it? per google translate: the icelandic for bat is kylfu. wikitionary has this to say about the etymology of bat. Dialectal variant (akin to Swedish dialect natt-batta) of Middle English bakke, balke, from Scandinavian (compare Old Swedish natbakka, Old Danish nathbakkæ 'night-flapper', Old Norse leðrblaka 'leather-flapper'). so this creature is like the "soul seeker." or soul mirror/ soul seeker. andi komist (soul seeker in icelandic) or andi spegill (soul mirror). ...spegill andi. spegilund...Seglund? segilund? segulant? Comusant? Andicombs? Great update, I love everything about it! I can't wait to stroll through that hamlet. Don't hate on the pink demon gnolls! Agreed haha I think it's something about the greenness of the landscape. Although I really like the artwork. The terracotta style roofing fits in with the S-America colonization period however. Beautiful art, as usual. I love the visual style you guys are going with. What can we expect when the second prototype is done? Gameplay footage? As far as features, I'm especially interested in learning more about class skills. Thanks for the update Adam, see you in two weeks! Wonderful update! And that town is just so perfectly Medieval; It's got French village vibes all over it. Also, the skuldr intrigue me, scare me even. They "see" souls, nowhere to run, nowhere to hide, and bad breath comes with the territory if you look like that. Finally, what Falkon said. It's a pet peeve of mine too. To whatever it takes to avoid DAO's Darkspawn swarming, for instance.